One of the backbone philosophies of the recent Labour party campaign was higher taxation of high earners (those earning above £80'000 per year to be precise). Has very high taxation of high earners ever worked or been effective as an economic policy? Historically and in other countries, have such high tax rates worked well and been a lasting policy which has helped a country pay for public services? What would be the repercussions of very high tax rates on high earners? Most European countries, especially Nordic ones, have high tax rates for high income, and it works perfectly. What are the repercussions of very high tax rates on high earners? Almost none. Although many get public tantrum on every tax increase and declare immediately going abroad, they generally stay and pay that taxes. Poor countries (like Eastern Europe) might have lower taxes, but the income is also low, so emigrating there means that your living standard would degrade in spite of lower taxes. There are single exceptions like Gerard Depardieu, but for most people changing citizenship simply won't work. You can't have rabbit and eat rabbit at the same time. The history of the USA is not devoid of high income tax marginal rates. During both World Wars, during the Great Depression (and even before Roosevelt's New Deal, btw) and until Reagan's tax reform in the 1980's, the rate of inflation-ajusted top bracket of earners was well above 60%, culminating at 94% after the Individual Income Tax Act of 1944. Without a counterfactual, whether it 'worked' or not can be debated for ages by economists and politicians, however the US economy sustained huge war efforts, overcame the Great Depression and developed the hyper-consumerist society during periods where the tax paid by the highest earners were much higher than today. Also, the raise of inegalities in the US since the late 1970's correlates with the lower level of taxation on the richest. NB: As pointed out in omments, the marginal tax rate is not equal to the average tax rate paid by a high-income taxpayer, since it only applies to highest bracket of his income. 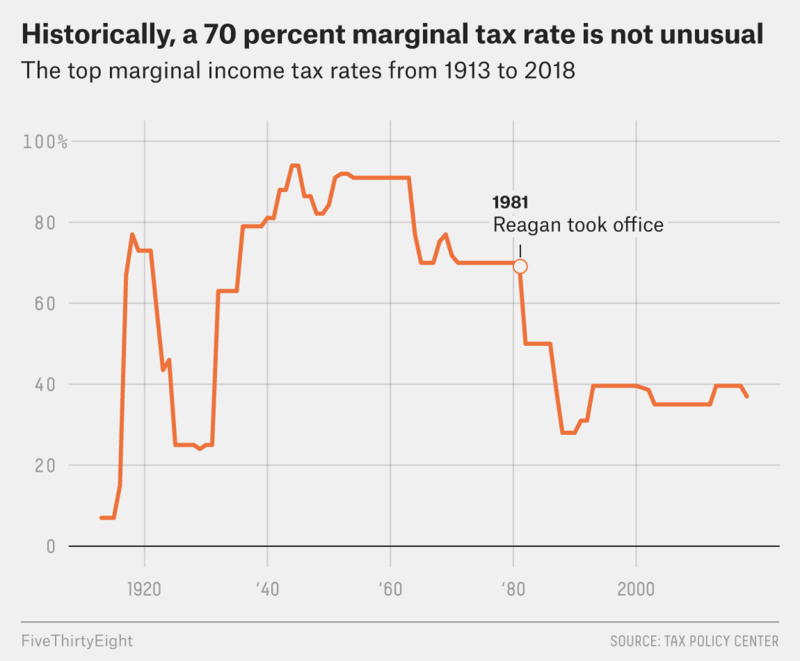 @Trilarion provides this nice link for both marginal and average tax rates through since 1900 in the US. @user189035 provides the study(pdf) from which the graphics are built. Of course, it doesn't apply if fraud is easier abroad. But most countries collaborate with the US on this. What do you mean by worked? If the question is, are there countries with progressive tax rates that have less income and wealth inequality than other countries with less progressive tax rates, then yes, they've worked. If the question is, are there countries that have successfully used progressive tax rates to decrease the taxation of the middle class, then no, they don't work. If you compare the United States, with a relatively low top rate to countries with higher top rates (including the US prior to 1980), the US gets more of its revenue from high income earners. As an example, let's compare the US and Denmark. Denmark has a higher top marginal income tax rate and lower income inequality than the US. US: 47.6% in California; 39.6% in states without an income tax (e.g. Washington). Denmark: 60.2%, starting around $55,000. US: 32nd highest at 46.1. We can easily see that Denmark has much higher taxation on high earners and lower income inequality. But it also has much higher taxation on moderate earners. That 60.2% maximum rate kicks in around $55,000, not much above the median household income. So in Denmark, everyone with above average income pays the same tax rate. In the US, the rate is lower and it applies to fewer families. Only those making more than $400,000 a year pay the top rate. And a far higher portion of the overall tax burden is paid by high earners. The top 1% of earners pay almost 40% of federal income taxes (from the Tax Foundation). Denmark also has a 25% VAT (value-added tax). Compare that to a top sales tax of 9.75% in California (combined state and local). And the sales tax is an exclusive tax, so it would be only 9% on an inclusive basis (matching the 25% VAT). Meanwhile, the VAT is an inclusive tax, so it would be 33% on an exclusive basis (matching the 9.75% sales tax). And VAT aren't progressive at all. People who make even the lowest salaries in Denmark have to pay VAT. Let's assume that they consume their entire income, with no savings. So even if they pay no income tax, they still pay 25% tax. In the US, someone making up to $19,725 only pays a 10% federal income tax (and that only on $9,325 of that income). So if we assume a 9% California sales tax on an inclusive basis (to match the 25% VAT), that still leaves 6% to pay local income taxes. That would be a rather high rate. We'll assume that the Earned Income Tax Credit (EITC) offsets any Social Security taxes. Overall, the tax exclusion saves about $1000 in the US compared to Denmark. So the working poor pay less tax in the US (and also receive fewer benefits). So overall, Denmark has higher but less progressive taxes than the United States. They would charge high earners at a high rate, but they have very few high earners to charge. So they charge lower earners at a higher rate than the US does. This is true even at the poorest levels, but is especially true between incomes of $55,000 (where the highest Danish rate starts) and $400,000 (above which the highest American rate starts). former answers on your question are very good, I would just add that the fact about corruption is missing, rich people finance polticiians and their political parties, therefore, some politicians protect the interest of riches and demand lower taxes for the richest. so, financing political party is very expensive, especially in big countries like France and Germany, Macron took the money from Rotchild and make the law as Rotchild needs it: worse labor law for workers and better for riches, lower taxes for riches, etc. when you take money from the rich, you must jump as they say. and I am sure, Macron needs 20M eur per year, maybe even per month, for his political party. nobody gives you 20M if you don't do something for him. Not the answer you're looking for? Browse other questions tagged economy taxes money or ask your own question. Has the FairTax ever been implemented anywhere on any scale?